Nippori Textile St. (日暮里繊維街) is a wholesale district of Japanese textiles and fabrics located in Tokyo. There are about 80 stores that sales various kinds of textiles and fabrics in great price. Not only textiles and fabrics, there are also many kinds of small accessories for handicrafts and fashion design. There is no parking or restroom. 1. use JR Yamanote Line to Nippori. Map around Nippori Textile St.
Nippori Textile Street is located Arakawa, Tokyo. 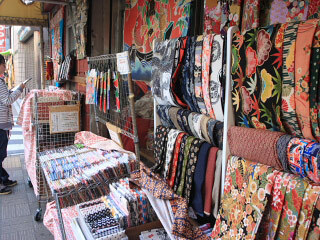 Nippori is well known for the wholesale district of textiles, fabrices and accessories for handicrafts. It has so many kinds of textiles and fabrics for fashion designers. Most of them sales Japanese products. It has everything what fashion designers and handicraft workers need. There is also 2nd hand Kimono shops as well.